Fionnuala Britton clinched Ireland's second medal of the European Indoor Championships after finishing a gutsy third in the women's 3,000m final. 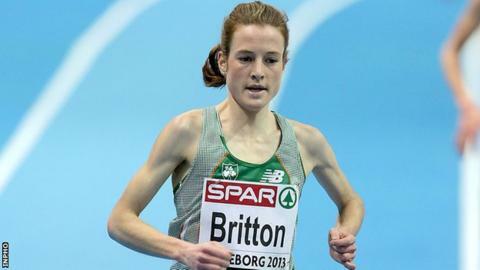 Britton looked set to finish fourth after she dropped almost 10 metres behind the third-placed Russian Elena Korobkina with 400m remaining. However, the Wicklow woman produced a finishing burst to finish .05secs ahead of the Russian as she clocked 9:00.54. Portugal's Sara Moreira took gold in 8:58.50 ahead of German Corinna Harrer. Harrer was almost pipped for silver by the Irishwoman but held on to cross the line in 9:00.50. The first kilometre was run at barely 10-minute pace for the distance but the race speeded up considerably in the second 1,000m as six athletes - including Britton - broke clear. Britton briefly moved into third place with 800m left but she was quickly passed by Korobkina and a frustrating fourth-place finish appeared on the cards as she dropped some distance behind the three leaders. However, the double European Cross Country Champion dug in courageously over the penultimate lap and chipped away at Korobkina before passing the Russian in the closing 10 metres. Korobkina attempted a last-gasp rally and the two athletes almost caught the German before the line intervened as Britton matched Ciaran O'Lionaird's achievement of winning a 3,000m bronze in Gothenburg. Britton's team-mate Ciara Everard ran bravely in the women's 800m final but had to settle for sixth place in 2:02.55 - over two seconds behind winner Ukrainian Nataliya Lupu. However, it was a highly successful championships for Everard who would not have been tipped as a likely finalist. Holder Britain's Jenny Meadows had to settle for fourth place in 2:01.52 as she continues her comeback following a series of injuries. City of Lisburn athlete Amy Foster finished seventh in her semi-final in 7.37 which was .04secs slower than her opening-round time on Saturday which equalled her personal best. Foster would have had ambitions of bettering Anna Boyle's Irish record of 7.30 on Sunday but it wasn't to be.